PRECISA 8000. 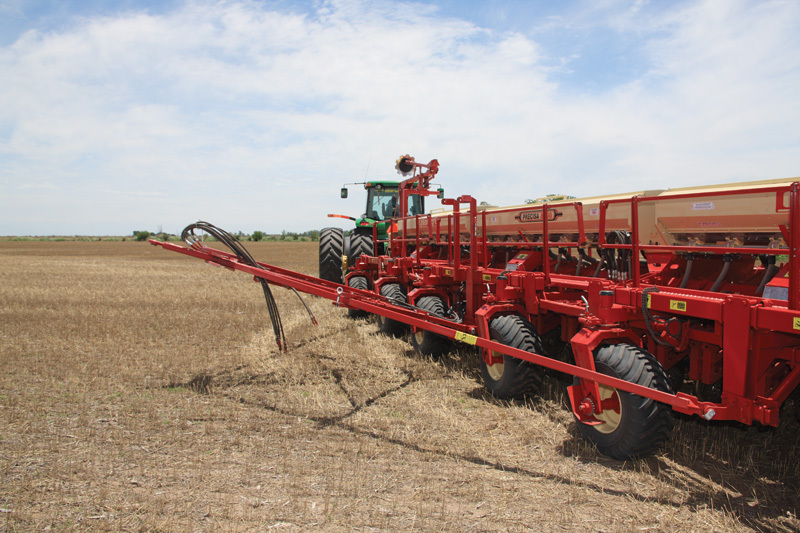 No-till planter and fertilizer. Organs of direct seeding system and fertilization placed in 3 articulated and independent parallelograms. Independent functioning of each organ. 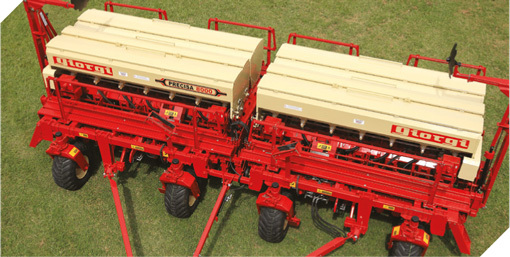 Accurate regulation of load for each system, varying the tension of each spring. 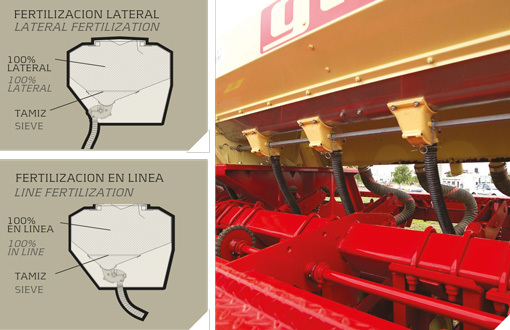 Prompt regulation of load, in the case of front blades and fertilizer disks, adding or removing the mechanical stops to each corresponding hydraulic cylinder operated by these sets. 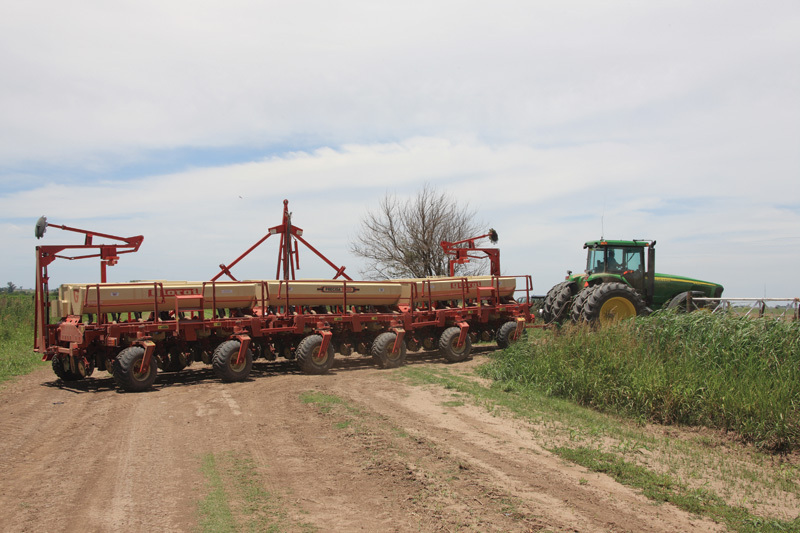 Parallelogram for the spike and planting row. Independent parallelogram for cutting front blade. 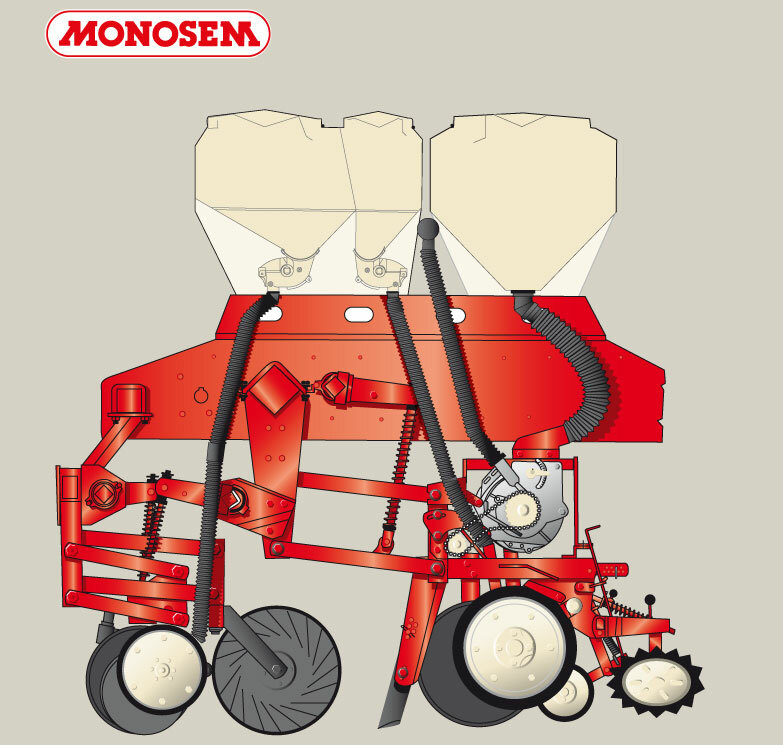 Parallelogram for lateral fertilizing next to the planting line. 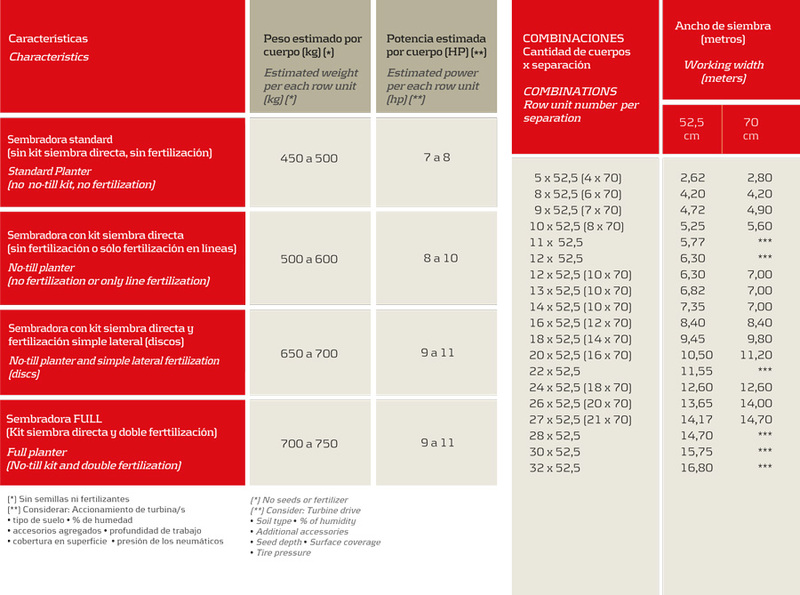 Better distribution of weight and loads. Seed hoppers: volume can be increased in a 25% or 50% according to standard volumes. 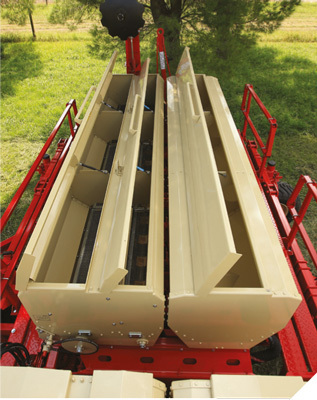 Simple fertilization hoppers: volumes can be increased up to 36% according to standard volumes. 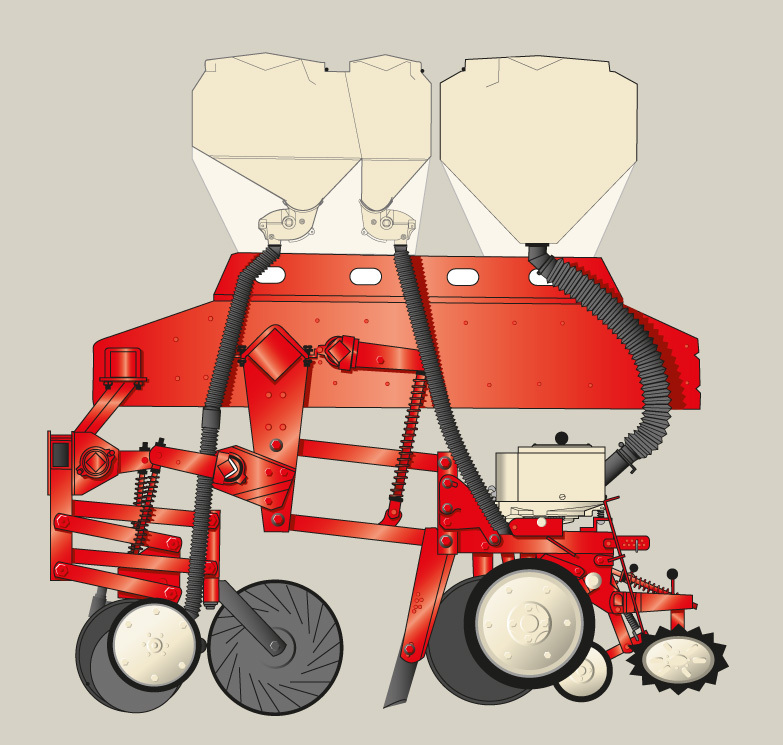 Double fertilization hoppers: volumes can be increased up to 32% according to standard volumes. Simple Fertilization hoppers: Simple fertilization of high volumen capacity. 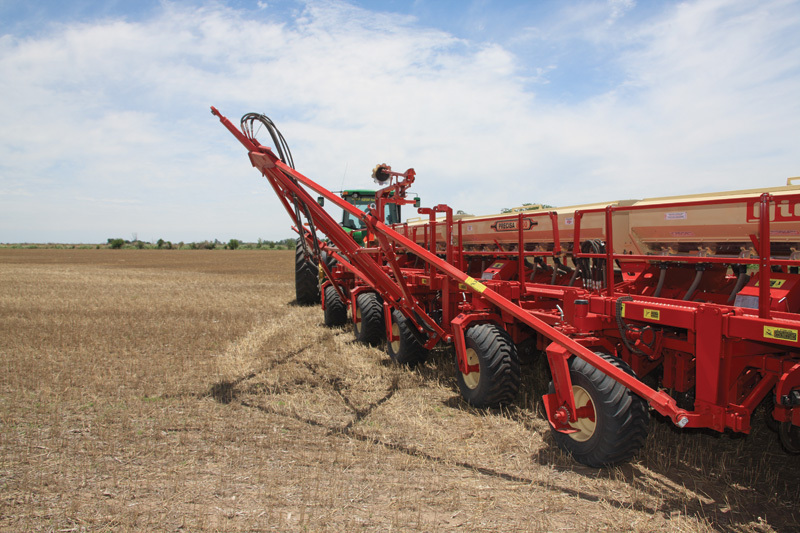 It provides more autonomous work. Two-sided caps: they can be opened forward of backwards. Interior lining with epoxy paint. Stainless steel sheet bottom. Removable sieve. Plastic ration device with chevron wheels, its inner gates can be overturned to enable its individual draining and cleaning. Other uses: According to its ration devices, this ration feed wagons can be used for lateral fertilization or fertilization in lines. 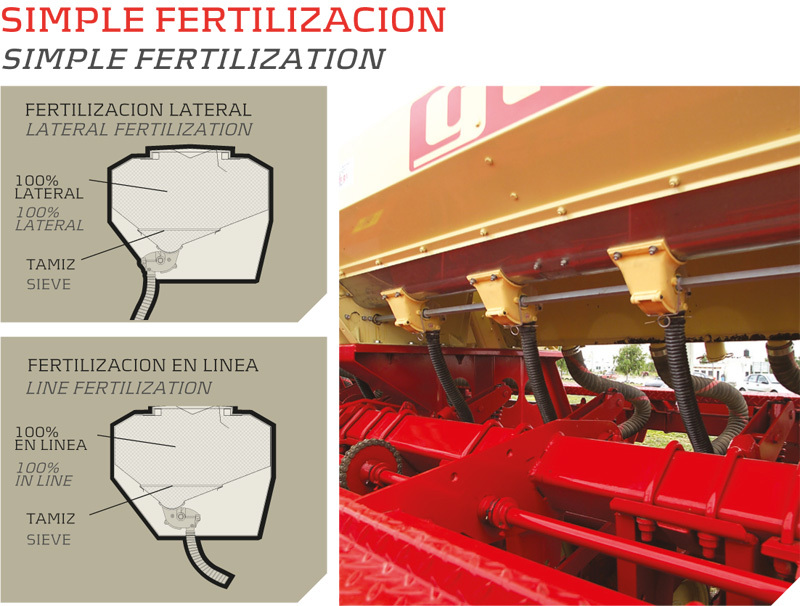 Double fertilization hoppers: High volumen capacity. 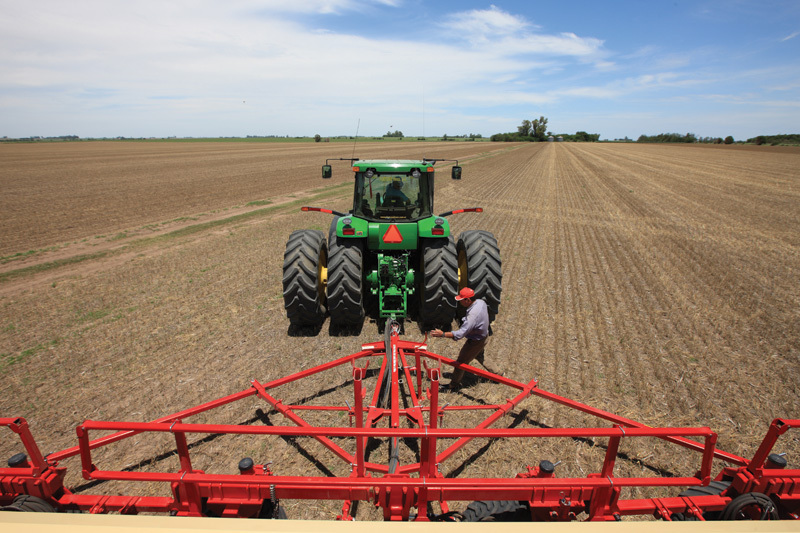 It provides more autonomous work. Two-sided caps: they can be opened forward of backwards. Interior lining with epoxy paint. Stainless steel sheet bottom. Removable sieve. Plastic ration device with chevron wheels, its inner gates can be overturned to enable its individual draining and cleaning. 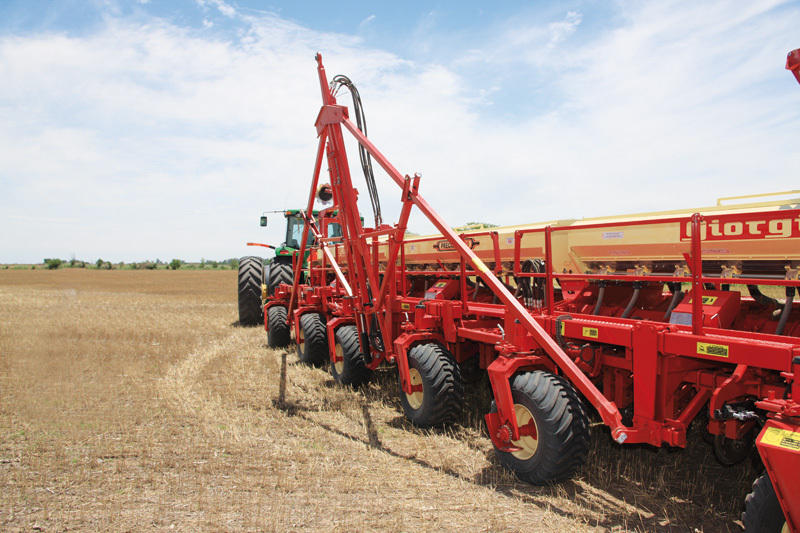 ROW UNIT WITH MECHANICAL SYSTEM. Seed disc with horizontal rotation. ROW UNIT WITH PNEUMATIC DISTRIBUTION SYSTEM. 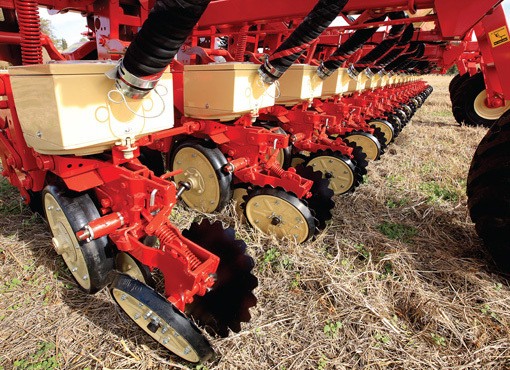 Seed disc with vertical rotation. 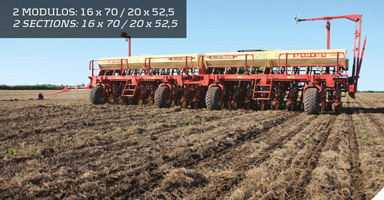 50 row units - separation 52.5 cm. 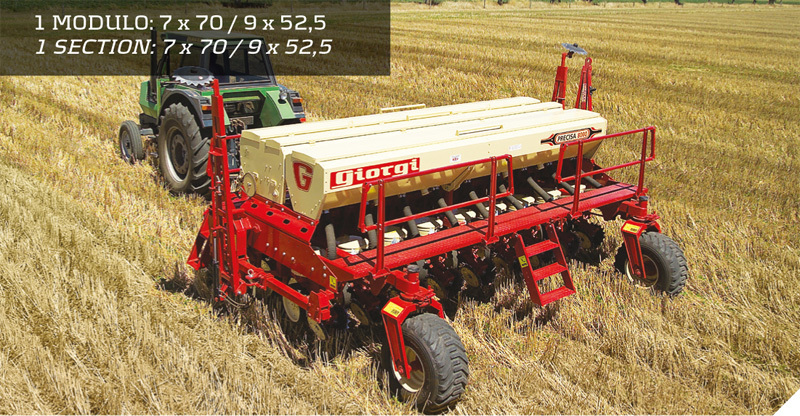 We present the result of a new development in Giorgi technology. 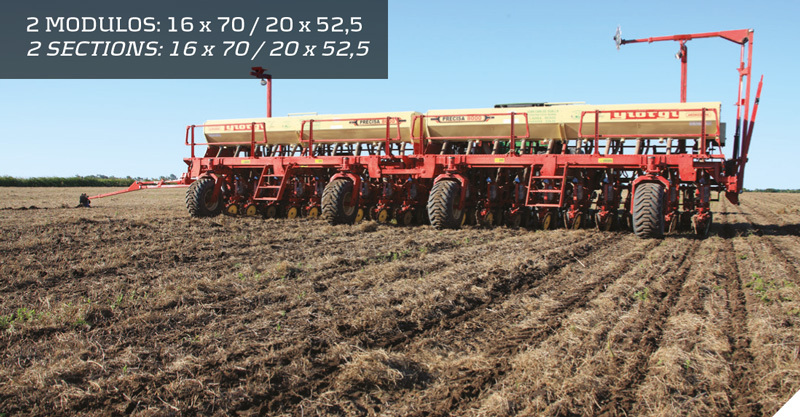 This launch breaks our own records: the new no-till planter PRECISA 8000 of 50 row units. 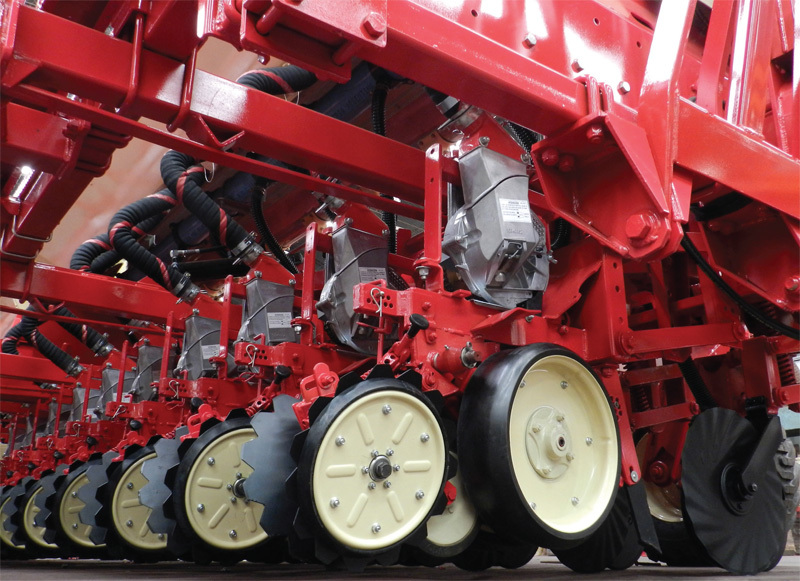 A great planter, 26.25 meters wide, it can plant an average of 20 hectares per hour; 8km/h. 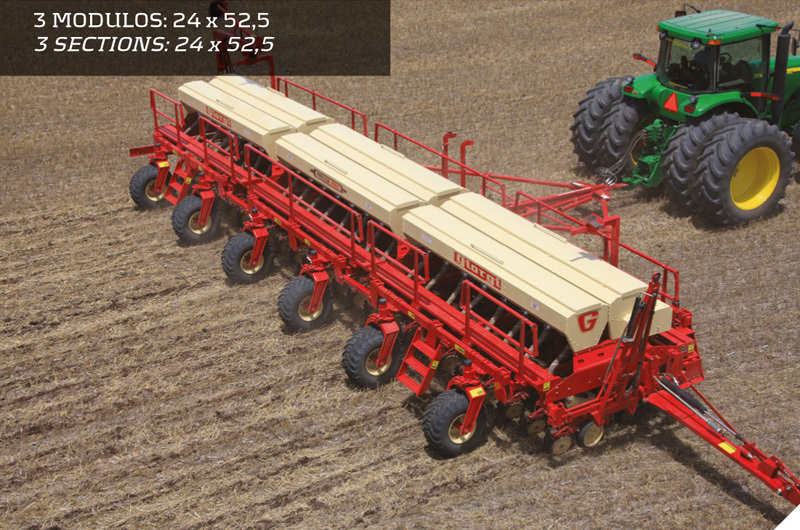 50 row units - separation 52.5 cm - Chassis: 5 sections, each 10x52.5 20 tires 400/60x15,5" - Seeds hoppers: capacity 7500 liters.